Notes: First planting of spring. Ritual fires are burned. A time for birth, healing and inspiration. This is a popular time for vows of dedication or consecration. IMBOLC (say EM-BOLK, also known by Christians as Candlemas), a Celtic Fire Festival, is a time of reawakening, a lighting of the way to new hope as the first quickening of the earth heralds the beginning of Spring. The flame of the candle is a testimony to transformation and the power of the spirit. It is a time of cleansing and purification. It is the opportunity to expunge the things that may stand in the way of our goals and to prepare ourselves for initiation or rededication to deeper spirituality. Now is the time when we sow the seeds of our life. This sabbat honors Bird (or Bride), the goddess of inspiration, healing, and smithcraft. Goddess of sacred wells, goddess of fire and the hearth, Her inspiration leads us to truth; Her waters heal us; Her flame burns in our hearts. Significant symbols include the Sacred Flame, the making of Brid’s Cross, candle lighting ceremony using white candles, seeds. It seems quite impossible that the holiday of Candlemas should be considered the beginning of spring. Here in the Heartland, February 2 may see a blanket of snow mantling the Mother. Or, if the snows have gone, you may be sure the days are filled with drizzle, slush, and steel-grey skies—the dreariest weather of the year. In short, the perfect time for a Pagan Festival of Lights. And as for spring, although this may seem a tenuous beginning, all the little buds, flowers, and leaves will have arrived on schedule before spring runs its course to Beltane. “Candlemas” is the Christianized name for the holiday, of course. The older Pagan names were Imbolc and Oimelc. 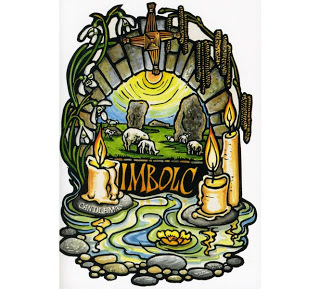 Imbolc means, literally, “in the belly” (of the Mother). For in the womb of Mother Earth, hidden from our mundane sight but sensed by a keener vision, there are stirrings. The seed that was planted in her womb at the solstice is quickening and the new year grows. Oimelc means “milk of ewes”, for it is also lambing season. The Catholic Church, never one to refrain from piling holiday upon holiday, also called it the Feast of the Purification of the Blessed Virgin Mary. (It is surprising how many of the old Pagan holidays were converted to Maryan feasts.) The symbol of the purification may seem a little obscure to modern readers, but it has to do with the old custom of “churching women”. It was believed that women were impure for six weeks after giving birth. And since Mary gave birth at the winter solstice, she wouldn’t be purified until February 2. In Pagan symbolism, this might be retranslated as when the Great Mother once again becomes the young Maiden Goddess. Today, this holiday is chiefly connected to weather lore. Even our American folk calendar keeps the tradition of “Groundhog Day”, a day to predict the coming weather, telling us that if the groundhog sees his shadow, there will be “six more weeks” of bad weather (i.e., until the next Old Holiday, Lady Day). This custom is ancient. An old British rhyme tells us that “if Candlemas Day be bright and clear, there’ll be two winters in the year”. Actually, all of the cross-quarter days can be used as inverse weather predictors, whereas the quarter days are used as direct weather predictors. Like the other High Holidays or Great Sabbats of the Witches’ year, Candlemas is sometimes celebrated on its alternate date, astrologically determined by the sun reaching fifteen degrees Aquarius, or Candlemas Old Style. Incidentally, some modern Pagan groups have recently begun calling the holiday itself ‘Brigit’, presumably as shorthand for “Brigit’s Day”. This lexical laziness is lamentable since it confuses a Deity name for the proper name of the holiday. The same disconcerting trend can be seen in the recent practice of referring to the autumnal equinox as ‘Mabon’, which is more properly the name of a Welsh God-form. Another holiday that gets mixed up in this is Valentine’s Day. Ozark folklorist Vance Randolph makes this quite clear by noting that the old-timers used to celebrate Groundhog Day on February 14. This same displacement is evident in Eastern Orthodox Christianity as well. Their habit of celebrating the birth of Jesus on January 7, with a similar postdated shift in the six-week period that follows it, puts the Feast of the Purification of Mary on February 14. It is amazing to think that the same confusion and lateral displacement of one of the old folk holidays can be seen from the Russian steppes to the Ozark hills, but such seems to be the case! Incidentally, there is speculation among linguistic scholars that the very name of “Valentine” has Pagan origins. It seems that it was customary for French peasants of the Middle Ages to pronounce a g as a v. Consequently, the original term may have been the French “galantine”, which yields the English word “gallant”. The word originally refers to a dashing young man known for his “affaires d’amour”, a true galaunt. The usual associations of V(G)alantine’s Day make much more sense in this light than their vague connection to a legendary ‘St. Valentine’ can produce. Indeed, the church has always found it rather difficult to explain this nebulous saint’s connection to the secular pleasures of flirtation and courtly love. For modern Witches, Candlemas O.S. may then be seen as the Pagan version of Valentine’s Day, with a de-emphasis of hearts and flowers and an appropriate reemphasis of Pagan carnal frivolity. This also realigns the holiday with the ancient Roman Lupercalia, a fertility festival held at this time, in which the priests of Pan ran through the streets of Rome, whacking young women with goatskin thongs to make them fertile. The women seemed to enjoy the attention and often stripped in order to afford better targets. One of the nicest folk customs still practiced in many countries, and especially by Witches in the British Isles and parts of the U.S., is to place a lighted candle in each and every window of the house (or at least the windows that face the street), beginning at sundown on Candlemas Eve (February 1), allowing them to continue burning until sunrise. Make sure that such candles are well seated against tipping and guarded from nearby curtains, etc. What a cheery sight it is on this cold, bleak, and dreary night to see house after house with candlelit windows! And, of course, if you are your coven’s chandler, or if you just happen to like making candles, Candlemas Day is the day for doing it. Some covens hold candle-making parties and try to make and bless all the candles they’ll be using for the whole year on this day. Other customs of the holiday include weaving “Brigit’s crosses” from straw or wheat to hang around the house for protection, performing rites of spiritual cleansing and purification, making “Brigit’s beds” to ensure fertility of mind and spirit (and body, if desired), and making “crowns of light” (i.e., of candles) for the high priestess to wear for the Candlemas Circle, similar to those worn on St. Lucy’s Day in Scandinavian countries.